Premiering on British television in 1976, The Muppet Show placed Jim Henson's titular characters in a vaudeville variety show. Absurdist, anarchic and slapstick in nature, the sketches featured parodies, songs and usually a human guest to provide some star power. Musical numbers featured heavily, with the celebrities happy to send themselves up on covers of standards or adaptations of their own songs. Alice Cooper playing an agent of Satan, for a faustian 'School's Out', Rudolf Nureyev fending off an amorous Miss Piggy in a gender flipped version of 'Baby It's Cold Outside' and Liza Minelli's salsa cabaret take on 'Copacabana'. The striking thing about many of these appearances is that despite the chaos of the world surrounding them they were played remarkably straight. Whether it's Johnny Cash delivering a flawless 'Ghost Riders in the Sky' surrounded by a barnful of Muppets, consumate pro Julie Andrews retooling 'The Lonely Goatherd' or Rita Moreno's sultry Emmy winning rendition of 'Fever'. Many songs have been written on the subject of not fitting in, 'Bein' Green' is a testament to feeling like you blend in a little too much, with Kermit lamenting that "It's not easy being green... it could be nicer being red or yellow or gold, or something much more colorful like that" - even if you are Kermit The Frog, sometimes living in the skin your were born in isn't enough. It's a sad optimism also offered by Kermit's nephew Robin on 'Halfway Down The Stairs'. Adapted from an AA Milne poem, 'Halfway..' depicts Robin in a state of emotional limbo, sitting on the middle step of a staircase musing that 'it isn't up, it isn't down'. A song sang by an introverted puppet shouldn't be so moving, but as one YouTube commenter remarked "if this song doesn't touch you, you're a monster". After appearing on The Muppet Show in 1976, song writer and American variety show mainstay Paul Williams began working with The Jim Henson Company on songs for the Muppets film debut, 1979's The Muppet Movie. Opening with the question "Why are there so many songs about rainbows? ", 'Rainbow Connection' is arguably the ultimate Muppet song. A wistful, profound ode to fighting the urge to be a cynic and choosing to find magic in the ordinary. It's aimed squarely, as Kermit sings, at "The lovers, the dreamers and me". It earned Williams and co-writer Kenneth Ascher an Oscar nomination and has been covered extensively, by artists including Willie Nelson and The Carpenters and reprised by Kermit himself in a 1980 duet with Debbie Harry on The Muppet Show. A run of films followed throughout the 1980s, with both The Great Muppet Caper and Muppets Take Manhattan earning oscar nominations for their music, before the sudden death of Jim Henson in 1990. Two memorial services were held, in New York and London and were open to the public with the only stipulations, taken from instructions drafted by Henson in 1986, were that no attendees wear black. The other notable request was for the presence of a jazz band. The New York service was a musical celebration of not just Henson but his creations. Big Bird singing 'Bein Green', Jerry Nelson performing 'Halfway Down The Stairs' in the voice of Robin, and culminating in an ensemble of Muppets and their performers performing 'Just One Person', a song taken from 'Snoopy! The Musical' loved so much by Henson that it made it's way into several of his own productions. The show went on, with 1992's The Muppet Christmas Carol, a musical reworking of the Charles Dickens novel that placed Jim's son Brian Henson in charge and brought Paul Williams back from the wilderness following years of substance abuse. In keeping with the tradition of guests on The Muppet Show before him, Michael Caine played Scrooge with a perfect poker face, vowing to Henson that he would play it like he was "working with the Royal Shakespeare Company". Years of TV specials and straight to video films followed until Jason Segel and Nicholas Stiller pitched a script to Disney that would become 2011's The Muppets. Described by Stiller as an "old school Muppets movie, where the Muppets have to put on a show to save the studio" 'The Muppets' modernised the road trip elements of The Great Muppet Caper and the 'let's put on a show' spirit of Muppets Take Manhattan, peppered with songs written by Brett McKenzie of Flight Of The Concords, including 'Man Or Muppet' which finally snagged The Muppets their first oscar. More recently The Muppets stepped into the live arena for the first time, with a three night residency at The Hollywood Bowl that showcased selections from their 40 year back catalogue, covers of Queen, Bowie and Adele ('Hello.. It's Moi') before culminating with Paul Williams leading an emotional ensemble performance of 'Rainbow Connection'. 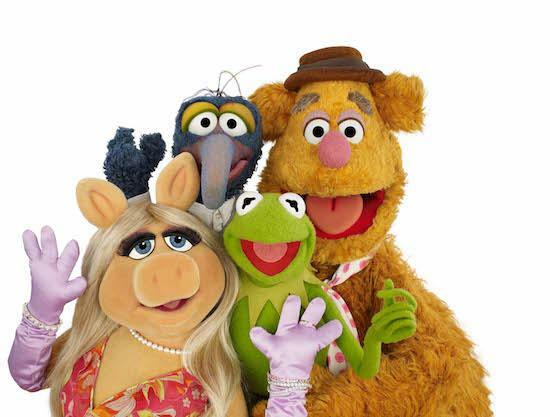 As the show prepares to for a stint in London this summer, The Quietus asked the Muppets to select 12 of their collective favourites. The Muppets are live in London on Friday 13th and Saturday 14th July, with evening shows and a matinee. Tickets can be found here. Click the image below to begin reading what Kermit, Miss Piggy, Animal, Gonzo and co selected.